Electronics Costs > How Much Does a Payphone Cost? How Much Does a Payphone Cost? A payphone is a coin-operated telephone that can be used by the public for a small charge. A payphone is usually located in a phone booth, and you need to insert a coin or slide a credit card before you can use it. Payphones are mostly installed in public areas where the phone company will either pay rent for the location and keep the revenue, or the landlord pays the rent and shares the revenue. Although payphones are not as common with the advent of mobile phones, there are still payphones available throughout the country. To use a payphone today, it can cost anywhere from $0.50 to $3 for the first few minutes, followed by $0.25 to $2 for each additional minute. Higher trafficked places, such an airport, can cost more. For example, PurpleMotes.com broke down the payphone costs at a local airport and found out the following: a local call would cost $0.50 for unlimited talking when using coins and $4.09 for a connection charge, plus $1.69 per minute if using a debit card. An intrastate long-distance call would cost $1 for four minutes. This can all depend on the country as well. For example, in Canada, the costs for a local payphone is $0.50. Kool1079 says today, payphones cost $0.50 and you can receive unlimited minutes. For those who want to purchase a payphone, one can cost anywhere from $80 to as much as $500 depending on the brand, its age, and other factors. Antique phones can cost as much as $1,500, while vintage payphones that no longer work can cost anywhere between $80 and $200. For example, PayPhone.com sells different types of payphones that range from an armored coinless phone to a weatherproof payphone. Most of the phones listed on this website can cost anywhere from $200 to $500. Enclosures, which protect the phone from weather conditions, can cost $150 to $200 for just the enclosure. Phone booth enclosures can cost anywhere from $100 to $500 or more depending on the size. Some payphones require that the phone needs to be programmed. If these programs are required, software and setups can start at $25 and go up from there. 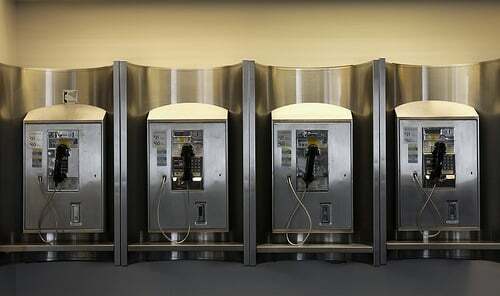 As of 2012, the FCC claimed there were around 243,000 payphones in the United States. While Verizon and AT&T were the big carriers in the market, both left the business, leaving payphones open to independent carriers/companies. As stated by the costs mentioned above, you will get a much better deal if you use coins instead of a debit/credit card. Some companies allow you to purchase a calling card for their payphones, offering a discount if you were to use it or pay a certain amount of minutes up front.